Draft: 2012, Milwaukee Brewers, CAth rd. Mitchell Evan Haniger…married to Amanda…graduated from Archbishop Mitty HS (CA)…attended Cal Poly San Luis Obispo for three years…earned Big West Freshman of the Year honors in 2010…named Big West Conference Player of the Year as a junior in 2012…his brother, Jason, was the Pirates 19th-round pick in 2008 draft out of Georgia Tech. The Totals - Hit .285 (170x596) with 90 runs, 38 doubles, 4 triples, 26 home runs, 93 RBI, 70 walks, a .366 on-base percentage, a .493 slugging percentage and an .859 OPS in 157 games with the Mariners...All-Star - Named to his 1st career AllStar Game…went 0-for-2 as a defensive replacement at the Midsummer Classic in Washington, D.C...Leader - Ranked among the top-20 American League leaders in batting (19th), runs (T14th), hits (T8th), doubles (13th), RBI (10th), walks (T13th), on-base percentage (11th), slugging percentage (16th), OPS (10th) and extra-base hits (T12th, 68)...Voting Season - Finished 11th in American League MVP balloting with 16 votes...Good Company - Became 1 of 7 Mariners outfielders in club history (done 16x) with at least 25 home runs and 90 RBI in a season…is the first Mariners outfielder to do so since Raúl Ibañez in 2006 and, at 27 years of age, is the youngest since Ken Griffey Jr.'s MVP campaign of 1997...Full 90 - Became 1 of 13 players in club history with 90+ runs and 90+ RBI in a season (last: Nelson Cruz, 2017)...Leading the Way - Moved into the leadoff spot in the batting order on Aug. 9 and went on to hit safely in 39 of 45 games batting leadoff, including 17 multi-hit games…overall, hit .330 (62x188) with 35 runs, 19 doubles, 2 triples, 8 home runs, 21 RBI, 2 HBP, 17 walks, a .388 on-base percentage and a .580 slugging percentage (.967 OPS) in 45 games batting leadoff…among all leadoff hitters in 2018, ranked 3rd in batting, 3rd in slugging, 3rd in OPS and 5th in on-base percentage…became the 4th Mariners leadoff hitter in club history (done 7x) to hit at least .330 in a season and the first since Ichiro Suzuki (.352) in 2009...Irreplaceable - Ranked 9th among American League position players with a WAR of 6.1 (Baseball-Reference)…was the highest bWAR of any Mariners outfielder since Franklin Gutierrez in 2009 (6.6)…became the 4th Mariners outfielder in club history (done 10x) with a bWAR of at least 6.1; Ken Griffey Jr. had 6 seasons of 6.1+ bWAR, followed by Ichiro Suzuki (2), Gutierrez (1) and Haniger (1)... Exist to Assist - Tied for the Major League lead in outfield assists with 12 (also Andrew Benintendi-BOS and Billy Hamilton-CIN)…his 12 outfield assists were most by a Mariner since Ichiro Suzuki also had 12 in 2004...Starter - Made 156 outfield starts, tops in the AL and 2nd-most in MLB (Nick Markakis-ATL, 160)....Gamer - Ranked 5th in the American League with 1376.2 innings played…trailed only Marcus Semien-OAK (1423.2), Alex Bregman-HOU (1404.0), Matt Olson-OAK (1403.1) and Francisco Lindor-CLE (1386.1)...Living On Base - Had 9 games in which he reached base at least 4 times, tied for 5th-most in the American League (also: José Ramírez-CLE and Shin-Soo Choo-TEX)…trailed Mookie Betts-BOS (20), Mike Trout-LAA (17), Jose Altuve-HOU (12) and Francisco Lindor-CLE (11)...Do the Splits - Hit .314 (54x172) vs. left-handers, compared to .274 (116x424) against right-handers, but had 22 of his 26 home runs and 69 of his 93 RBI against right-handers… his .314 average against lefties was 10th-best in the American League...On It - From April 20-30, homered in 6 of 10 games, including 4 consecutive games, April 20-23...Daily Double - Tallied 21 doubles following the All-Star break, tied for 5th-most in the Major Leagues (also: Randal Grichuk-TOR). Extra, Extra! - Tallied 68 extra-base hits (38 doubles, 4 triples, 26 home runs), tied with Stephen Piscotty-OAK for 12th-most in the American League…his 68 extra-base hits were the most by a Mariners player since 2016 when Robinson Canó, Nelson Cruz and Kyle Seager each eclipsed that mark…had 2 games with 3 extra-base hits; only 6 American Leaguers had more games with 3+ XBH in 2018: Mookie Betts-BOS (7), Alex Bregman-HOU (3), Matt Chapman-OAK (3), Francisco Lindor-CLE (3), Giancarlo StantonNYY (3) and Mike Trout-LAA (3)…on Aug. 9 at Houston, became the 8th Mariners leadoff hitter in club history with 3 extra-base hits, including a home run, in a game and the first since Jean Segura (9/2/17 vs. OAK)...Double Up - His 38 doubles were most by a Mariner since José López in 2009 (42)… ranked T12th in the American League (also: José Ramírez-CLE)...Off and Running - In March/April, hit .309 (30x97) with 17 runs, 6 doubles, 1 triple, 10 home runs, 27 RBI, 1 HBP, 12 walks, a .384 on-base percentage and a .701 slugging mark (1.085 OPS) in 27 games…became the 3rd Mariners player (done 4x) to hit at least 10 home runs in March/April, joining Ken Griffey Jr. (13 HR, 1997 and 11 HR, 1998) and Nelson Cruz (10 HR, 2015)…joined Ken Griffey Jr. as the only Mariners in club history to record at least 27 RBI in March/April; Griffey had 30 RBI in March/April, 1997, and 27 RBI in March/April, 1998...It's a Walk-Off Winner - Was 1 of 4 American Leaguers with multiple walk-off home runs in 2018, joining Jeimer Candelario-DET, Khris Davis-OAK and Justin Smoak-TOR…hit walk-off home runs on June 1 vs. Tampa Bay and on June 13 vs. Los Angeles-AL…is the 15th player in club history with 2 walk-off home runs in a single season (last: Adam Lind and Leonys Martín, 2016)...On a Roll - Had a career-high 17-game hitting streak, Aug. 18-Sept. 5…tied for the 5thlongest hitting streak in MLB in 2018 (also: 4 others)…during the streak, hit .306 (22x72) with 13 runs, 4 doubles, 1 triple, 5 home runs, 7 RBI, 9 walks, a .398 on-base percentage and a .597 slugging mark (.995 OPS)....He's a Winner - Ranked 6th in the Majors with 15 game-winning RBI...Ouch - Missed games July 5 vs. Los Angeles-AL and July 6 vs. Colorado with a bruised right knee. 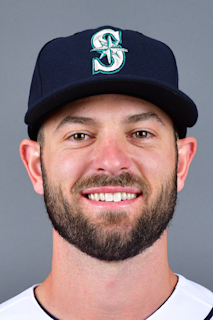 Totals - Hit .282 (104x369) with 58 runs, 25 doubles, 2 triples, 16 home runs, 47 RBI, 31 walks, a .352 on-base percentage and a .491 slugging mark in 96 games with Seattle... Table-Setter - Hit .318 (69x217) with 45 runs, 16 doubles, 2 triples, 11 home runs, 30 RBI, 24 walks, a .401 on-base percentage, a .562 slugging mark and a .963 OPS while batting 2nd in the order…his .318 average ranked 5thbest among #2 hitters in the Majors and 3rd-best in the AL... He's On First - Recorded a 13-game hitting streak, April 6-19, batting .380 (19x50) with 13 runs, 4 doubles, 4 home runs and 15 RBI…his 13-game hitting streak is tied for the 6th-longest hitting streak by a rookie in club history (also: Ichiro Suzuki, 9/21 - 10/7/01)... In a Starting Role - Despite missing 60 games due to two appearances on the disabled list, made 95 starts in the outfield, 8th-most in club history by a rookie... Bases Unloaded - Hit .545 (6x11) with 2 doubles, 1 home run and 14 RBI with the bases loaded…his .545 average with the bases loaded ranked T3rd-best in the American League... Best vs. the West - In 55 games vs. the AL West, hit .317 (70x221) with 38 runs, 16 doubles, 2 triples, 12 home runs, 28 RBI, a .381 on-base percentage, a .570 slugging mark and a .951 OPS. ..Off and Running - In 21 games in the month of April, hit .342 (27x79) with 20 runs, 7 doubles, 1 triple, 4 home runs, 16 RBI, 13 walks, a .447 on-base percentage and a .608 slugging mark... Tale of the 2nd Half - After the All-Star Break, hit .290 (56x193) with 23 runs, 13 doubles, 1 triple, 9 home runs, 24 RBI, 8 walks, a .328 on-base percentage and a .508 slugging mark in 49 games... September Surge - Hit .365 (42x115) with 17 runs, 8 doubles, 1 triple, 7 home runs, 14 RBI, a .387 on-base percentage and a .635 slugging mark in 27 games in the month of September… among American League leaders in September, ranked T1st in hits, 4th in batting, T5th in extra-base hits (16), T6th in doubles and 8th in slugging and OPS... Hit After Hit - Tallied 42 hits in the month of September, becoming one of 3 Mariners rookies in club history (done 4x) to record at least 40 hits in a calendar month…joins Ichiro (47 H in May, 2001 and 51 H in August, 2001) and Ben Gamel (42 H in June, 2017)... High Five - Went 5-for-5 with 1 run and 3 doubles on September 30 at Los Angeles-AL… became the 4th Mariners rookie all-time with 5 hits in a game (last: Mike Carp, 9/20/11 at MIN)…became the first Mariner ever to collect 5 hits and 3 doubles in a game... Historic - After going 5-for-5 with 3 doubles on September 30 at Los Angeles-AL, became the 14th rookie in MLB history (since 1901) to collect at least 5 hits and 3 doubles in a game and the first since Montreal's Warren Cromartie on July 4, 1977 (Game 1) at Chicago-NL... DL Stints - Made two trips to the disabled list…on the 10-day DL, April 26 - June 11 with a strained right oblique, missing 42 games…included a rehab assingment with AAA Tacoma… on the 10-day DL, July 30 - August 18 with a facial laceration, missing 18 games… included a rehab assignment with Tacoma. Totals - Hit .229 (25x109) with 9 runs, 2 doubles, 1 triple, 5 home runs and 17 RBI in 34 games with Arizona...Quite the Debut - Made his Major League debut with Arizona on Aug. 16 vs. New York-NL…went 2-for-4 with 1 run, 1 double, 1 triple and 3 RBI, the most XBH and RBI by a D-backs player in his ML debut…recorded his first Major League hit with a triple off Noah Syndergaard in the bottom of the 6th inning...Year to Remember - Named the Diamondbacks Minor League Player of the Year after batting .321 (147x458) with 79 runs, 34 doubles, 5 triples, 25 home runs, 94 RBI and 12 stolen bases in 129 games with AA Mobile and AAA Reno…named to the Southern League midseason All-Star team... Leading the Way - At the time of his selection by Arizona (8/16), among Minor League leaders, ranked T5th in extra-base hits (60), 7th in OPS (1.011) and 11th in RBI (86). In 55 games with AA Mobile, hit .281 (43x153) with 10 doubles, 1 triple, 1 home run and 19 RBI…finished the season with advanced-A Visalia, batting .332 (67x202) with 40 runs, 16 doubles, 3 triples, 12 home runs and 36 RBI in 49 games. Enters the 2014 season as the third-best prospect in the organization according to Baseball America.....ranked 10th entering the 2013 season. Entered the season as the 10th-best prospect and best outfield arm in the Brewers organization (Baseball America)…hit .297 (43x145) with 5 home runs and 25 RBI in 41 games with A Wisconsin before being promoted to High-A Brevard County…batted .250 (82x328) with 6 home runs and 43 RBI in 88 games with Brevard County. Selected by Milwaukee in the supplemental fi rst round of the First-Year Player Draft.....signed by Dan Huston...After being drafted, missed most of the 2012 season with a partial tear of the posterior cruciate ligament in his right knee.....suffered the injury on a play at the plate on 7/5 at Cedar Rapids. Selected by New York-NL in the 31st round of the First-Year Player Draft.....did not sign. August 19, 2017 Seattle Mariners activated RF Mitch Haniger from the 10-day injured list. August 12, 2017 Seattle Mariners sent RF Mitch Haniger on a rehab assignment to Tacoma Rainiers. July 30, 2017 Seattle Mariners placed RF Mitch Haniger on the 10-day disabled list. Facial laceration. June 11, 2017 Seattle Mariners activated RF Mitch Haniger from the 10-day disabled list. June 6, 2017 Seattle Mariners sent RF Mitch Haniger on a rehab assignment to Tacoma Rainiers. April 26, 2017 Seattle Mariners placed RF Mitch Haniger on the 10-day disabled list. Strained right oblique. September 6, 2016 Arizona Diamondbacks recalled RF Mitch Haniger from Reno Aces. August 26, 2016 Arizona Diamondbacks optioned RF Mitch Haniger to Reno Aces. August 16, 2016 Arizona Diamondbacks selected the contract of Mitch Haniger from Reno Aces. June 10, 2016 OF Mitch Haniger assigned to Reno Aces from Mobile BayBears. April 2, 2016 OF Mitch Haniger assigned to Mobile BayBears from Visalia Rawhide. March 8, 2016 OF Mitch Haniger assigned to Arizona Diamondbacks. June 24, 2015 OF Mitch Haniger assigned to Visalia Rawhide from Mobile BayBears. March 8, 2015 OF Mitch Haniger assigned to Arizona Diamondbacks. August 22, 2014 Mobile BayBears activated OF Mitch Haniger from the 7-day disabled list. August 16, 2014 Mobile BayBears sent OF Mitch Haniger on a rehab assignment to AZL D-backs. August 1, 2014 Mobile BayBears placed OF Mitch Haniger on the 7-day disabled list. July 31, 2014 Arizona Diamondbacks traded RF Gerardo Parra to Milwaukee Brewers for LHP Anthony Banda and RF Mitch Haniger. July 31, 2014 OF Mitch Haniger assigned to Mobile BayBears. July 23, 2014 Huntsville Stars activated RF Mitch Haniger from the 7-day disabled list. June 20, 2014 Huntsville Stars placed RF Mitch Haniger on the 7-day disabled list retroactive to June 17, 2014. April 2, 2014 OF Mitch Haniger assigned to Huntsville Stars from Brevard County Manatees. January 22, 2014 Milwaukee Brewers invited non-roster RF Mitch Haniger to spring training. May 23, 2013 OF Mitch Haniger assigned to Brevard County Manatees from Wisconsin Timber Rattlers. March 17, 2013 OF Mitch Haniger assigned to Milwaukee Brewers. September 17, 2012 Mitch Haniger roster status changed by Wisconsin Timber Rattlers. July 6, 2012 Wisconsin Timber Rattlers placed OF Mitch Haniger on the 7-day disabled list. June 21, 2012 OF Mitch Haniger assigned to Wisconsin Timber Rattlers. June 15, 2012 Milwaukee Brewers signed RF Mitch Haniger.